When calculating an estimate of intrinsic value, it is important to consider the historical earnings results along with the market’s implied estimate for future growth. Here, the company has grown its EPSmg (normalized earnings) from $1.96 in 2010 to only an estimated $2.42 for 2014. This level of demonstrated growth is in stark contrast to the market’s implied estimate of 74.66%. In fact, historical growth has only been 4.79% in recent years. There would have to be an incredible increase in the company’s growth in order to be worth the current market pricing, and such a growth rate would be unsustainable over a 7-10 year period. As a result, the company appears to be significantly overvalued at the present time. 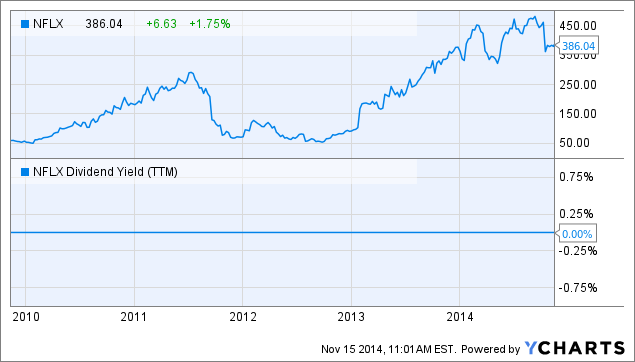 Be sure to check out previous ModernGraham valuations of Netflix Inc. for better perspective! Disclaimer: The author did not hold a position in Danaher Corporation (DHR) or in any other company mentioned in this article at the time of publication and had no intention of changing that position within the next 72 hours. Logo taken from Wikipedia for the sole purpose of identifying the company; this article is not affiliated with the company in any manner.